Cell-free protein synthesis is a rapid and efficient method for the production of recombinant proteins. Usage of prokaryotic cell-free extracts often leads to non-functional proteins. Eukaryotic counterparts such as wheat germ extract (WGE) and rabbit reticulocyte lysate (RLL) may improve solubility and promote the correct folding of eukaryotic multi-domain proteins that are difficult to express in bacteria. However, the preparation of WGEs is complex and time-consuming, whereas RLLs suffer from low yields. Here we report the development of a novel cell-free system based on tobacco Bright Yellow 2 (BY-2) cells harvested in the exponential growth phase. The highly-productive BY-2 lysate (BYL) can be prepared quickly within 4–5 h, compared to 4–5 d for WGE. The efficiency of the BYL was tested using three model proteins: enhanced yellow fluorescent protein (eYFP) and two versions of luciferase. The added mRNA was optimized by testing different 5’ and 3’ untranslated regions (UTRs). The protein yield in batch and dialysis reactions using BYL was much higher than that of a commercial Promega WGE preparation, achieving a maximum yield of 80 μg/mL of eYFP and 100 μg/mL of luciferase, compared to only 45 μg/mL of eYFP and 35 μg/mL of luciferase in WGEs. In dialysis reactions, the BYL yielded about 400 μg/mL eYFP, representing up to 50% more of the target protein than the Promega WGE, and equivalent to the amount using 5Prime WGE system. Due to the high yield and the short preparation time the BYL represents a remarkable improvement over current eukaryotic cell-free systems. Cell-free protein synthesis (CFPS) systems based on crude lysates provide several advantages over in vivo systems and offer broad applications in protein engineering, biopharmaceutical product development and post-genomic research . Crude lysates contain the necessary components for translation, protein folding, and energy metabolism, so providing them with amino acids, energy substrates, nucleotides and salts allows almost any protein encoded by a RNA template to be synthesized. In coupled transcription/translation systems supplemented additionally with an appropriate RNA polymerase DNA templates can also be used. In contrast to traditional cell-based expression methods, CFPS offers shorter process times, limited protein hydrolysis and the ability to express toxic proteins or proteins containing specific chemical groups or unnatural amino acids at defined positions . Furthermore, the open nature of the system allows the reaction to be controlled and monitored directly. Although chemical synthesis allows the rapid and controlled synthesis of peptides < 40 residues in length, this is not an economically feasible method for the production of larger proteins . The most widely used cell-free systems are based on Escherichia coli extract (ECE), wheat germ extract (WGE), rabbit reticulocytes lysate (RLL) and insect cell extract (ICE). These contain diverse cellular components and co-factors that enhance protein expression, folding and modification in different ways. Therefore, the most appropriate system will depend on the origin and the biochemical nature of the target protein. The preparation of ECE is simple and inexpensive, and generally achieves the highest protein yields, from hundreds of micrograms to milligrams per milliliter in batch reactions depending on the target protein [4, 5]. In contrast, eukaryotic systems are less productive and extract preparation is more laborious, but complex proteins can be produced more efficiently and extended post-translational modifications are supported. WGE normally yields tens of micrograms to milligrams of recombinant protein per milliliter, depending on the protein and reaction format [6–8], but extract preparation takes 4–5 d, and the yield of extract from wheat seeds is low . The yields of RLL systems are typically two orders of magnitude lower than WGE  and ICEs prepared from Spodoptera frugiperda can achieve yields of up to 50 μg/mL . Recently two further eukaryotic systems based on CHO cells  and Saccharomyces cerevisae have been described. The CHO extract yield up to 50 μg/mL active firefly luciferase, but the fermentation medium is quit expensive. In contrast the preparation of the yeast extract is inexpensive, but the system produces only low target protein levels of 8 μg/mL active firefly luciferase. The drawbacks of current cell-free systems have therefore created a demand for highly-productive eukaryotic cell-free systems that can be prepared quickly in large amounts. Here we describe a highly-productive in vitro translation system derived from tobacco BY-2 cells. This type of cells was used due to the eukaryotic nature, the simple and cost-effective fermentation and the well-established genetic modification tools. 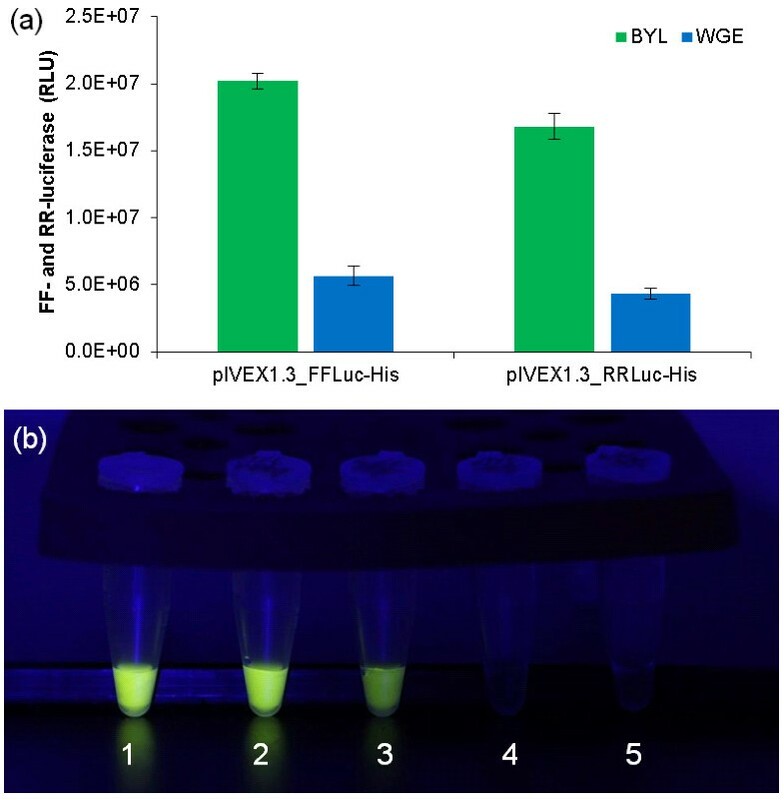 The novel system was tested against commercial WGEs for the production of three model proteins: enhanced yellow fluorescent protein (eYFP), firefly luciferase (FFLuc) and Renilla reniformis luciferase (RRLuc). By measuring the activity of these optical reporter proteins, the rate of translation was determined without radioactive substrates. Several different 5’ and 3’ untranslated regions were also compared for their translation enhancing activity. At present in vitro translation systems suffer from certain shortages like laborious extract preparation, low protein synthesis yields or the inability to support posttranslational modifications . The aim of this study was to establish a system, allowing the rapid preparation of lysates for cell-free synthesis of satisfactory recombinant protein yields. For this purpose, we further developed a system based on BY-2 cell suspension cultures designed for the replication of plant RNA viruses [15, 16]. In contrast to the original protocol using batch-cultured cells, we used BY-2 cells growing continuously in a stirred-tank fermenter at a constant packed cell volume of 20% and a doubling time of around 32 h, to ensure a reproducible supply of homogeneous cell material. We also replaced the conventional cell wall-digesting enzymes (Cellulase Onozuka RS, Pectolyase Y-23 and Macerozyme R-10) with the liquid enzymes Rohament CL, Rohament PL and Rohapect UF, originally intended for the production of fruit juice and extracts. Rohament CL comprises a cellulase concentrate, Rohament PL is a pectinase concentrate, and Rohapect UF contains an enzyme complex including specialized pectinases and arabanases. This reduced the costs for the protoplastation step more than 100-fold. However, the most important step in the lysate preparation is the removal of the lytic vacuoles (Figure 1). These contain a great part of undesirable enzymes, including proteases and ribonucleases. Lysates prepared without the evacuolation step show nearly no translation activity . The vacuoles were removed by centrifugation in a Percoll gradient using a modified method based on those described by Komoda et al. and Ishibashi et al.. Due to its low density vacuoles can be separated from the protoplasts yielding high-density evacuolated protoplasts. The continuous Percoll layer described in the reports listed above was replaced with a stepwise density gradient, and the protoplasts were applied directly onto the Percoll-free top layer. After centrifugation, the evacuolated protoplasts concentrated at the interface between the 40% and 70% Percoll layers (Figure 1a), whereas the separated vacuoles floated on the top layer. The purity of the evacuolated protoplasts was verified by microscopy (Figure 1b,c). The yield of the evacuolation step was ~65%, estimated using a Neubauer counting chamber. The evacuolated protoplasts were washed and then disrupted by nitrogen decompression to protect labile cell components from oxidation . After the removal of nuclei and non-disrupted cells, the lysate was incubated with nuclease S7 to destroy endogenous mRNA and to reduce background translation to a minimum . This step leaves the integrity of the 18S and 28S ribosomal RNAs mainly unaffected and therefore increases the translation efficiency of exogenous mRNA substantially . Preparation of evacuolated tobacco BY-2 protoplasts by Percoll gradient centrifugation. (a) Evacuolated protoplasts are concentrated at the interface between 40% and 70% Percoll. (b) Representative image of protoplasts before evacuolation (Scale bar = 20 μm). (c) Representative image of evacuolated protoplasts (Scale bar = 20 μm). The evacuolation step is comparable to the endosperm removal step during WGE preparation, and is essential because the endosperm contains several translation inhibitors such as tritin and thionin, as well as nucleases and proteases [6, 9, 19]. However, the evacuolation step takes ~90 min, whereas endosperm removal requires 2–3 d because embryo particles remaining after the grinding and sieving of wheat seeds must be selected manually to eliminate those containing larger amounts of endosperm . Without the preselection of embryo particles by flotation using toxic organic solvents such as carbon tetrachloride, the selection process would take even longer . The lysis of the evacuolated protoplasts takes ~30 min, which again is much faster than the equivalent process during WGE preparation, i.e. 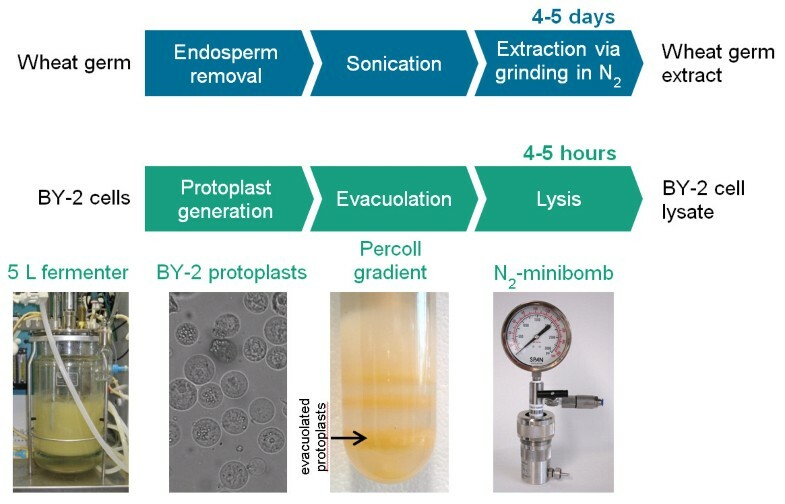 the extraction of the wheat embryos which takes 5–7 h . Furthermore, the nitrogen decompression method for protoplast lysis protects labile components from oxidation, in contrast to the crushing of embryo particles in a mill/mixer or the disruption of protoplasts using a Dounce homogenizer as described in the original protocol [15, 16]. Figure 2 compares the timelines for the preparation of BYL and WGE, showing that the preparation of BYL takes 4–5 h compared to 4–5 days for the WGE. A 3-L BY-2 cell suspension culture can yield ~30 mL of BYL with a final protein concentration of 14.9 ± 0.3 mg/mL . Flowchart showing the preparation of WGE (top panel) and BYL (bottom panel). WGE (top panel). The endosperm is removed from wheat seeds and embryo particles are washed extensively to remove translation inhibitors from the endosperm. To obtain the extract, the washed embryo particles are ground with a mortar under liquid nitrogen or in a Waring blender. BYL (bottom panel). BY-2 cells are cultivated in a 5-L fermenter, harvested in the exponential growth phase (at least 5 days post-inoculation) and converted into protoplasts. The vacuoles are separated from the protoplasts by centrifugation over a stepwise Percoll gradient. The resulting evacuolated protoplasts are lysed using the nitrogen decompression method. The performance of BYL compared to commercial WGEs was investigated by producing the reporter proteins eYFP and luciferase in both systems and measuring fluorescence, which is much faster than standard methods and does not involve radioactive labeling. Kahn et al. and Yukawa et al. demonstrated that the fluorescence of GFP produced in cell-free systems was comparable with the radioactivity of 35S methionine incorporated during the translation process, showing that translation yield can be quantified by fluorescence measurement. Similarly, a correlation between luciferase activity and the incorporation of 14C leucine has been demonstrated in WGE, RLL and ECE [23, 24]. To maximize protein expression, we optimized the mRNA sequence introduced into the BYL translation reaction. Several mRNA structural characteristics affect translation efficiency  including the untranslated regions (UTRs) at the 5’ and 3’ ends of the coding sequence [26, 27]. The structure of the 5’ UTR influences translational initiation, termination and mRNA stability . One of the rate-limiting steps in translational initiation is the binding of the mRNA to the 43S pre-initiation complex . The translational machinery is recruited by the 5’-cap or translational enhancers in the leader sequence [30–33]. To find the optimal UTRs for the BY-2 system, we constructed eight different eYFP expression constructs with various 5’ and 3’ UTRs (Figure 3). The 5’ UTR in pCITE2a contains an internal ribosomal entry site (IRES) derived from Encephalomyocarditis virus (EMCV), which is widely used in eukaryotic host cells and cell-free extracts [34, 35]. The pF3A vector was designed for use with wheat germ extract and contains sequences from Barley yellow dwarf virus (BYDV) . The pIX4.0 vector used with ICEs contains the 5’ UTR from a baculovirus polyhedrin gene and a synthetic 3’ UTR including a poly(A) sequence. The polyhedrin promoter achieves the highest yields in the ICE system [37–40], but because it is also compatible with the WGE and RLL systems  we assumed it would also be functional in the BYL. The 5’ UTR in the pIVEX1.3 vector includes an ARC-1 sequence element, which is complementary to an internal 18S rRNA segment  and may promote binding to the 40S ribosomal subunit . This 18S RNA region is highly conserved among eukaryotes , so we assumed it would be functional in both the BYL and WGE systems. The Tobacco mosaic virus (TMV) 5’-UTR (omega sequence) is a well-known translational enhancer that is included in the vectors pIVEX_Omega_eYFP-His and pIVEX_GAA_Omega_eYFP-His [44–47]. It is functional as an enhancer not only in tobacco plants, but also in the WGE, RLL and ECE cell-free systems . The TMV omega sequence was improved by adding GAA upstream of the initial GUA triplet . The pIVEX_GAA_E02 construct contains a synthetic sequence which was selected by its ability to promote the formation of polysomes in WGEs . Schematic representation of different eYFP and luciferase expression constructs with various 5’ and 3’ UTRs. EMCV IRES, Encephalomyocarditis virus internal ribosomal entry site; BYDV 5’ UTR, Barley yellow dwarf virus 5’ untranslated region; BPH 5’ UTR, Baculovirus polyhedrin gene 5’ untranslated region; Ω, Tobacco mosaic virus 5’ leader sequence (omega); GAA_Ω, Tobacco mosaic virus 5’ leader sequence (omega) with GAA as first nucleotide triplet; GAA_E02, synthetic 5’ leader sequence; TMV, Tobacco mosaic virus; 5’ UTR*, repetition of a sequence complementary to the 18S ribosomal RNA; 3’ UTR*, trailer sequence with synthetic poly(A) signal; FFLuc, firefly luciferase; RRLuc, Renilla reniformis luciferase. The eYFP expression constructs described above were used as templates to produce capped mRNA in vitro in the presence of the cap analog m7G[5’]ppp[5’]G. Non-incorporated nucleotides and cap analogs were removed by gel filtration, and 2 μg of the purified mRNA was translated in the BYL and WGE (Promega) systems for 18 h. The optimal reaction conditions were defined by monitoring eYFP fluorescence using capped GAA_Omega_eYFP-His mRNA as a template. The highest eYFP fluorescence was detected in the presence of 1.44 mM magnesium acetate and 61 mM potassium acetate (Figure 4a,b). Because the optimal potassium concentration is dependent on the template, each construct was evaluated in the same manner. The optimum potassium concentration ranged from 61 mM (Figure 3; constructs 1, 2, 4a, 4b, 6) to 68 mM (Figure 3; constructs 3, 5, 7). The influence of the template concentration was determined using capped GAA_Omega_eYFP-His mRNA, and saturation was observed at ~40 ng/μL (Figure 4c). Polyadenylation sequences are known to increase translational efficiency and mRNA stability . So we exchanged the TMV 3’ UTR sequence in pIVEX1.3_eYFP-His and GAA_Omega_eYFP-His with the equivalent sequence in pIX4.0_His-eYFP, containing a synthetic poly(A) sequence, but this exchange actually reduced the yield of the target protein (Figure 4d). Similarly, Sawasaki et al. found that translation in WGE does not depend on a specific 3’ UTR or a poly(A) sequence, but rather on the length of the 3’ UTR. Optimization of reaction conditions in batch mode. Effects on eYFP yield caused by (a) magnesium acetate concentration, (b) potassium acetate concentration, (c) mRNA concentration, (d) presence (+) or absence (-) of poly(A) sequence. Translation reactions were carried out using capped GAA_Omega_eYFP-His mRNA as the template at 25°C and 500 rpm for 18 h. The relative fluorescence intensities are shown. Mean values were calculated from three independent translation experiments. In the WGE system, we used 2.1 mM magnesium according to the manufacturer’s instructions. The optimal concentrations of potassium and mRNA were determined as described for the BYL system (data not shown). The highest fluorescence intensities were achieved at potassium concentrations of 103 mM (Figure 3, construct 2), 133 mM (constructs 1, 4a, 4b, 5, 6 and 7) and 163 mM (construct 3). As for the BYL system, 40 ng/μL of capped GAA_Omega_eYFP-His mRNA was sufficient. When the optimal concentrations were used with both systems, BYL yielded significantly more eYFP than WGE (p < 0.01) with all eight constructs (Figure 5). GAA_Omega_eYFP-His was the most productive construct in both systems, achieving maximum yields of ~78 ± 9 μg/mL eYFP in the BYL system and 44 ± 4 μg/mL eYFP in WGE batch reactions, after incubation at 25°C and 500 rpm for 18 h. Based on our findings the pCITE 5’ UTR is deemed unsuitable for both the BYL and WGE systems, even though it has previously been used for the replication of plant RNA viruses in a similar BY-2 system . This may reflect the absence of specific translation factors. As expected, construct pIVEX1.3_eYFP-His worked well in both systems, probably due to the strong conservation of the 18S rRNA sequence among eukaryotes. The lysate batch variations of four different preparations tested in quadruplicates using capped GAA_Omega_eYFP-His mRNA as template was ±9% (Additional file 1). Translation of eYFP mRNAs with various 5’ and 3’ UTRs in BYL and WGE systems in batch mode. Reactions were carried out with 2 μg capped mRNA as the template at 25°C and 500 rpm for 18 h. The amount of fluorescent protein was calculated by comparing with an eYFP standard curve generated by measuring different eYFP concentrations in BYL translation reactions without the mRNA template. Data represent the averages and standard deviations of six independent translation experiments. We also compared the expression of luciferase genes from firefly (FFLuc) and Renilla reniformis (RRLuc) in the BYL and WGE systems, by exchanging the eYFP sequence in pIVEX1.3_eYFP-His for the corresponding luciferase genes (Figure 3). Again, we used 2 μg of capped mRNA as a template and the reactions were incubated at 25°C and 500 rpm for 18 h. The translation of both the firefly and Renilla luciferase RNAs was 350% higher than in the WGE, corresponding to more than ~100 μg/ml of the target protein (Figure 6a,b). These data showed that the target protein yields were similar with three different model proteins. Translation of firefly and Renilla reniformis mRNAs in the BYL and WGE systems. 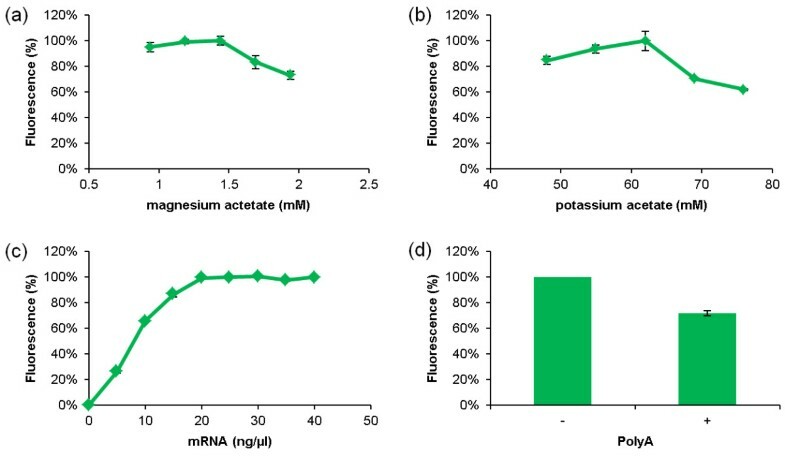 Reactions were carried out with 2 μg capped mRNA as the template at 25°C and 500 rpm for 18 h. (a) Bar graphs show luciferase activity expressed as relative luciferase units (RLU). Data represent the averages and standard deviations of six independent translation experiments. (b) Typical result of FFLuc translation in the BYL and WGE systems, in which 1 μl of reaction mixture was combined with 50 μl luciferase assay buffer: FFLuc standard with 0.1 μg/μl (1), pIVEX1.3_FFLuc-His in BYL (2), pIVEX1.3_FFLuc-His in WGE (3), no template control in BYL (4), no template control in WGE (5). Although the BYL system is highly productive, sustainable in vitro protein synthesis can only be achieved in dialysis mode when substrates and energy components are continuously supplied across a semi-permeable membrane. Dialysis mode also dilutes potentially inhibitory reaction byproducts, which contributes to the higher protein yields. To evaluate the BYL system in dialysis mode, we used RTS Wheat Germ continuous exchange cell-free (CECF) devices (5Prime) and compared the BYL system to the two commercial WGEs from Promega and 5Prime. The reaction mixtures for the BYL and Promega WGE systems were prepared as described above for batch mode production. The feeding solutions were used in 20 fold excess and contained the same components as the reaction mixtures with the exception of lysate, mRNA, RNase inhibitor and creatine phosphokinase. The reaction mixture for the 5Prime WGE system was prepared according to the manufacturer’s instructions. We restricted the comparison to those constructs yielding the highest amounts of eYFP in the batch reactions, i.e. constructs 4a, 4b and 6 (Figure 5). We used 60 ng/μl of m27,3’-OG[5’]ppp[5’]G capped mRNA as the template. For all three constructs, the BYL system was substantially more productive than the Promega WGE system (Figure 7a,b), producing 150% more eYFP when tested with the vectors pIVEX1.3_eYFP-His and GAA_Omega_eYFP-His. Surprisingly vector pIVEX1.3_His-eYFP was largely inactive in the Promega WGE system, but worked fine in the BYL. The BYL system was also more productive than the 5Prime WGE system, yielding ~130% more eYFP when tested with pIVEX1.3_His-eYFP and ~150% more eYFP when tested with pIVEX1.3_eYFP-His. The eYFP yield from vector GAA_Omega_eYFP-His was comparable in both systems. For construct GAA_Omega_eYFP-His in each case 10 μl of the BYL and WGE translation reactions were analysed by SDS-PAGE (Figure 7b). Notably, eYFP expression in the BYL system could be enhanced more than five-fold by switching from batch production to dialysis mode. Translation of eYFP mRNAs in BYL and WGE systems in dialysis mode. Reactions were carried out with 3 μg capped mRNA as the template at 25°C and 900 rpm for 18 h and 24 h, respectively. The amount of fluorescent protein (a) was determined by comparison with an eYFP standard curve generated by measuring different eYFP concentrations in BYL translation reactions without a mRNA template. Data represent the averages and standard deviations of six independent translation experiments. (b) SDS-PAGE of the BYL and WGE translation reactions. In each case 10 μl of the translation reactions were loaded on a 4-12% gradient gel. Lane 1: GAA_Omega_eYFP-His in BYL; lane 2: no template control in BYL; lane 3 GAA_Omega_eYFP-His in 5Prime WGE; lane 4: no template control in 5Prime WGE; lane 5: GAA_Omega_eYFP-His in Promega WGE; lane 6: no template control in Promega WGE; M: molecular weight marker. In summary, the BYL is a promising system with high translational activity, short preparation time and high potential for scaling-up. It is likely that the efficiency of the BYL system can be improved further, e.g. by optimizing reaction conditions through a factorial design approach . The BYL system is based on eukaryotic components and should therefore be suitable for the expression of eukaryotic proteins, but further studies are required to determine whether the BYL system is capable of carrying out modifications such as glycosylation and the formation of disulfide bonds. A coupled transcription/translation system based on the BYL shall also be addressed in further studies. Tobacco cells (Nicotiana tabacum L. cv. Bright Yellow 2, BY-2) were cultivated continuously in a 5-L fermenter (Type 100e, Applicon Biotechnology, AC Schiedam, Netherlands) with a 20% packed cell volume at 26°C in the dark in Murashige-Skoog liquid medium (Murashige and Skoog Basal Salt Mixture, Duchefa Biochemie, Haarlem, Netherlands) supplemented with 3% (w/v) sucrose, 1 mg/L thiamine-HCl, 0.2 mg/L 2,4 dichlorophenoxyacetic acid and 100 mg/L myo-inositol. The preparation of lysate from evacuolated BY-2 protoplasts was carried out as described by Komoda et al. and Gursinsky et al. with significant modifications. Protoplasts were prepared from cells in the exponential growth phase of a continuous fermentation at a constant packed cell volume of 20% by treating the cells with 3% (v/v) Rohament CL, 2% (v/v) Rohament PL, and 0.1% (v/v) Rohapect UF (all from AB Enzymes, Darmstadt, Germany) in 0.37 mM mannitol, 5 mM CaCl2, 12.5 mM sodium acetate (pH 5.8) for 1.5 h. The resulting protoplasts were layered onto a discontinuous Percoll gradient containing (from bottom to top) 70% (v/v, 3 ml), 40% (v/v, 5 ml), 30% (v/v, 3 ml), 15% (v/v, 3 ml) and 0% (3 ml) Percoll (GE Healthcare, Munich, Germany) in 0.7 M mannitol, 20 mM MgCl2, and 5 mM PIPES-KOH (pH 7.0). After centrifugation at 12,000 g for 1 h at 25°C in a swinging bucket rotor, evacuolated protoplasts were recovered from the 40-70% (v/v) Percoll solution interface. The evacuolated protoplasts were suspended in three volumes of TR buffer (30 mM HEPES-KOH (pH 7.4), 80 mM potassium acetate, 0.5 mM magnesium acetate, 2 mM DTT) supplemented with one tablet per 50 ml of Complete EDTA-free Protease Inhibitor Mixture (Roche Diagnostics, Mannheim, Germany) and disrupted using the nitrogen decompression method in a cell disruption vessel (Parr Instrument, Frankfurt, Germany) for 30 min at 10 bar. Nuclei and non-disrupted cells were removed by centrifugation at 500 g for 10 min at 4°C. The supernatant was supplemented with 0.5 mM CaCl2 and treated with 75 U/ml nuclease S7 (Roche Diagnostics) for 15 min at 20°C. The lysate was supplemented with 2 mM EGTA as chelating agent for the Ca2+ ions to inactivate the nuclease and frozen at -80°C in 1-ml aliquots. Plasmid pIVEX1.3_eYFP-His was kindly provided by Dr. Stefan Kubick (Fraunhofer Institute for Biomedical Engineering, Potsdam-Golm, Germany). Plasmid pIVEX_GAA_Omega_eYFP-His was prepared by inserting annealed oligonucleotides 1 and 2 (Additional file 2) containing the T7 promoter and the TMV 5’ leader sequence (omega) into pIVEX1.3_eYFP-His using the NspI and NcoI sites. Plasmid pIVEX_GAA_E02_eYFP-His was prepared by inserting annealed oligonucleotides 3 and 4 (Additional file 2) containing the T7 promoter and the synthetic 5’ UTR E02 into pIVEX1.3_eYFP-His using the NspI and NcoI sites. Plasmids pIX4.0_His-eYFP, pIVEX1.3_His-eYFP, pF3A_His-eYFP and pCITE2a_His-eYFP were generated by amplifying the His-eYFP sequence from pIX3.0_His-eYFP (kindly provided by Dr. Stefan Kubick) using the following primers (Additional file 2): 5 and 6 for cloning into pIX4.0_eCFP (kindly provided by Dr. Stefan Kubick), 5 and 7 for cloning into pIVEX1.3_eYFP-His and pF3A (Promega, Mannheim, Germany), and 5 and 8 for cloning into pCITELuc (kindly provided by Dr. Sven-Erik Behrens, Institute of Biochemistry and Biotechnology, Halle/Saale, Germany). The PCR products were digested with BspHI and NotI, BspHI and KpnI, and BspHI and XbaI, respectively, and introduced into the NcoI and NotI sites of pIX4.0_eCFP, the NcoI and KpnI sites of pIVEX1.3_eYFP-His and pF3A, and the NcoI and XbaI sites of pCITELuc. Omega_eYFP-His was generated using a two-step PCR procedure (Sawasaki et al., 2007). In the first step, eYFP-His was amplified using pIVEX1.3_eYFP-His as a template and the two gene-specific primers 9 and 10 (Additional file 2). 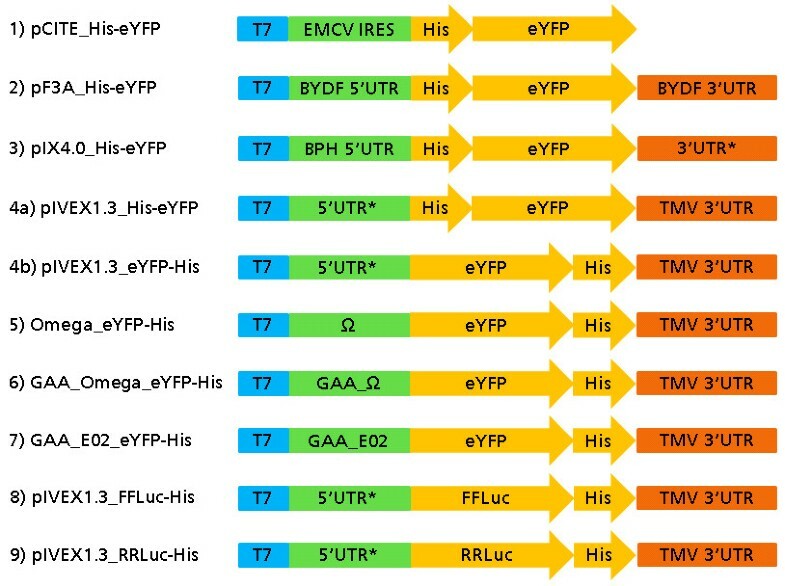 In the second step, the T7 promoter and omega sequence were fused to eYFP-His using primers 11 (5’ end of T7 promoter), 12 (3’ end of T7 promoter and omega sequence) and 10 as the previous step. For vector pIVEX1.3_FFLuc-His, the FFLuc gene was amplified by PCR using pCITELuc as the template and primers 17 and 18 (Additional file 2). The product was digested with NcoI and XhoI and reintroduced into pCITELuc in-frame with the His-tag to generate pCITE2a_FFLuc-His. Then the FFLuc-His gene was amplified using primers 17 and 19 and introduced into the NcoI and KpnI sites of pIVEX1.3_eYFP-His. The RRLuc gene was amplified by PCR using pSP_RRLuc (kindly provided by Dr. Sven-Erik Behrens) as the template and primers 20 and 21 (Additional file 2). The product was digested with NcoI and XhoI and inserted into pCITELuc to generate pCITE2a_RRLuc-His. The RRLuc-His sequence was then amplified using primers 20 and 21 and inserted into the NcoI and KpnI sites of pIVEX1.3_eYFP-His to generate pIVEX1.3_RRLuc-His. Plasmids pIVEX1.3_eYFP-His_Poly(A) and pIVEX_GAA_Omega_eYFP-His_Poly(A) were generated by amplifying the 3’-UTR from pIX4.0_His-eYFP by PCR using primers 22 and 23 and inserting the product into the KpnI and EcoRI sites of pIVEX1.3_eYFP-His and pIVEX_GAA_Omega_eYFP-His. Capped mRNA was transcribed in vitro in the presence of the cap analogs m7G[5’]ppp[5’]G or m27,3’-OG[5’]ppp[5’]G (New England Biolabs, Ipswich, MA, USA) using the T7 High Yield RNA Synthesis Kit (New England Biolabs) and DNA templates amplified by PCR from the constructs described above using Phusion Polymerase (New England Biolabs) and the following primers (Additional file 2): 10 and 13 for pIVEX1.3_eYFP-His, pIVEX1.3_His-eYFP, pCITE2a_His-eYFP, pIVEX1.3_FFLuc-His and pIVEX1.3_RRLuc-His; 10 and 14 for pIVEX_GAA_Omega_eYFP-His, pIVEX_GAA_E02_eYFP-His and pIX4.0_His-eYFP; 10 and 11 for Omega_eYFP-His, and 15 and 16 for pF3A_His-eYFP. The RNA was purified using the DyeEx 2.0 Spin Kit (Qiagen, Hilden, Germany). Batch reactions contained 50% (v/v) BYL, 30% (v/v) modified TR buffer (30 mM HEPES-KOH, pH 7.6, 80 mM potassium acetate, 2 mM DTT), 0.75 mM ATP, 0.1 mM GTP, 25 mM creatine phosphate, 50 μM of each amino acid, 80 μM spermine and 0.2 mg/mL creatine phosphokinase (Roche Diagnostics). The magnesium concentration was adjusted with magnesium acetate to 1.44 mM and the potassium concentration was adjusted with potassium acetate to 61 mM or 68 mM, according to the expression construct. Any magnesium and potassium already present in the BY-2 cell extracts was ignored. The batch translation reactions were carried out at 25°C and 500 rpm for 18 h in a thermomixer (Eppendorf, Hamburg, Germany). WGE (Promega) translation reactions were carried out according to the manufacturer’s instructions. Dialysis reactions were carried out in RTS 100 Wheat Germ continuous exchange cell-free (CECF) devices (5Prime, Hamburg, Germany) using the same mixtures described for the batch reactions except that we also added 40 units of murine RNase Inhibitor (New England Biolabs). Feeding solutions contained 67.5% (v/v) modified TR buffer. For the BYL system this was 30 mM HEPES-KOH (pH 7.6), 90 mM potassium acetate, 2.1 mM magnesium acetate and 2 mM DTT, supplemented with 0.75 mM ATP, 0.1 mM GTP, 25 mM creatine phosphate, 50 μM of each amino acid and 80 μM spermine. For the Promega WGE system this was 30 mM HEPES-KOH (pH 7.6), 200 mM potassium acetate, 3.1 mM magnesium acetate and 7.4 mM DTT, supplemented with 1.2 mM ATP, 0.1 mM GTP, 10 mM creatine phosphate, 80 μM of each amino acid and 500 μM spermidine. Translation reactions in dialysis mode were carried out at 25°C and 900 rpm for 18 h in a thermomixer (Eppendorf). Translation reactions with the RTS 100 Wheat Germ CECF Kit (5Prime) were carried out according to the manufacturer’s instructions. The fluorescence signal from eYFP was quantified using a Synergy HT Multi-Mode Microplate Reader (Biotek, Bad Friedrichshall, Germany) with 485/20 nm excitation and 528/20 nm emission filters. The quantity of eYFP was determined by generating a standard curve based on different concentrations of eYFP in BYL translation reactions without a mRNA template. The eYFP standard was produced in a home-made E. coli in vitro translation system and purified by immobilized metal-affinity chromatography (IMAC) and size exclusion chromatography (SEC). The concentration of protein was determined using a colorimetric assay. Firefly and Renilla luciferase activities were measured with the Luciferase Assay System (Promega) and a GENios Pro microplate reader (Tecan, Mainz-Kastel, Germany). Firefly luciferase purchased from Roche Diagnostics was used as a standard. SDS-PAGE was performed using precast NuPAGE 4-12% polyacrylamide Bis-Tris gels (Life Technologies, Carlsbad, CA, USA). The gel was stained with Coomassie brilliant blue R-250. PageRuler Prestained Protein Ladder (Thermo Scientific, Waltham, MA, USA) was used as molecular weight marker. We would like to thank Dr. Stefan Kubick (Fraunhofer Institute for Biomedical Engineering, Potsdam-Golm, Germany) for providing the vectors pIVEX1.3_eYFP-His, pIX4.0_eCFP and pIX3.0_His-eYFP. We also thank Dr. Sven-Erik Behrens (Institute of Biochemistry and Biotechnology, Halle/Saale, Germany) for providing the plasmids pCITELuc and pSP_RRLuc. Furthermore we would like to thank Dr. Tanja Holland (Fraunhofer Institute for Molecular Biology and Applied Ecology IME/IPP, Aachen, Germany) for her help with the BY-2 cell cultures. This work was funded by the Federal Ministry of Education and Research (BMBF, FKZ 0315942) and the Fraunhofer Society. We have filed a patent application relating to the use of continuous fermentation for providing cell material for preparation of the tobacco BY-2 cell-free lysate. MB carried out the in vitro translation experiments, the product analysis and drafted the paper. SV cultured the BY2 cells and prepared the BY2 lysate. HS participated in the design of the study. SS participated in the design of the study and helped to draft the manuscript. All authors read and approved the final manuscript.